Book: Communicating the American Way: A Guide to Business Communications in the U.S.
Based on real-life corporate and professional situations, the book offers actionable advice and practical tips both for the seasoned international professional and for the young graduate. 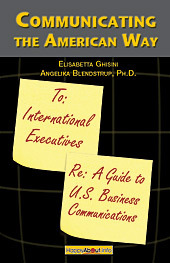 After an initial, short description of the U.S. culture, the book discusses a number of communication challenges foreigners typically face in the business world: running meetings, using email, talking on the phone, standing out in job interviews, giving a speech or presentation, dealing with reporters, and speaking English like a leader. Ch 1: Why should you use this book? Ch 3: How to run a meeting in the U.S.
Ch 7: How to conduct a successful job interview in the U.S.
Ch 10: The importance of networking in the U.S. Written in simple, accessible English, the book is packed with real-life anecdotes and compelling examples of what can go wrong due to cultural misunderstandings. 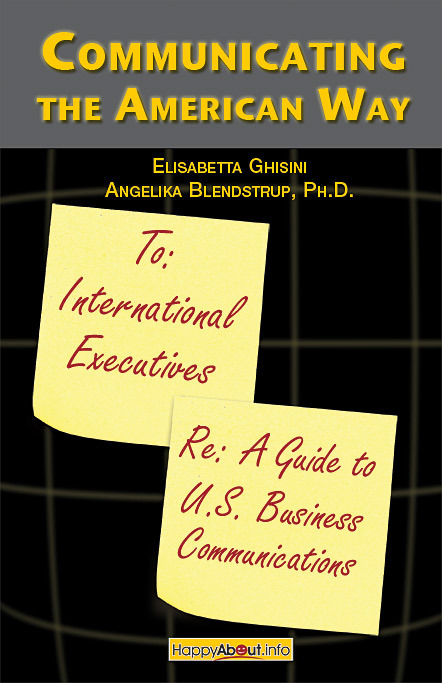 The first hands-on guide to U.S. business communication written in English, the book helps readers understand why, despite their good language skills, they dont always get the results they want with their colleagues or their boss. The enjoyable style makes it easy for readers to learn proven techniques that will enhance their communication effectiveness. Each chapter has boxes and illustrations providing examples of typical pitfalls for international professionals in specific situations, such as meetings, presentations, email, job interviews, media interviews, networking etc. By showing the readers how to crack the "code" of doing business in the U.S., the authors want to give them tools to improve their communication skills and to fulfill their potential. This book is a must read for those interntional professionals who want to propel their career forward. "After living in the U.S. for 6.5 years, I still find the content and the advice this book gives very helpful in my everyday business. I wish I had had a book like this when I first moved here. It is a fun read and it explains in accessible English what to watch out for to avoid embarrassing misunderstandings." "Communication is paramount to achieving business success in the U.S. . By reading this book you will greatly enhance your chances to reach your business goals here. A 'must read' in an increasingly global environment, this book will guide foreign professionals to navigate the U.S. cultural communications code. Thumbs up to the authors for providing insights and effective tips and showing the readers how to really communicate the American way." Antoine Hugoo, Director U.S. Operations, Apec International Programs, A French Professionals Employment Agency. "Whether they live in India, China, Russia or Brazil, global professionals know that their daily interactions with American employers or customers are a minefield of potential misunderstandings and missed opportunities. This hands-on book shows them how to communicate the American way and truly connect with their U.S. colleagues. Presentations, meetings, phone calls - and more: this book covers all you need to know to fit in smoothly into the American workplace." Elisabetta Ghisini is a communications consultant with over 15 years of experience in the U.S. and in Europe. She specializes in international business communications and coaches senior executives on keynote speeches, corporate presentations, and media interviews. She is an instructor at the Graduate School of Business at Stanford University, where she teaches media workshops and interviewing skills. Previously, Elisabetta was a public relations director with Burson-Marsteller, where she orchestrated the worldwide media launch of Agilent Technologies; prior to that she was a communications manager with the international consulting firm McKinsey & Co., where she crafted high-impact employee communications programs for multinational clients (including HP, Bank of America, Sun Microsystems). A native of Italy, Elisabetta holds an advanced degree in German Literature from the Universita Statale di Milano (Dottore in Lingue e Letterature Straniere Moderne). She speaks four languages and has taught business communications skills in executive training programs around the world. Elisabetta is Co-Executive Editor of the Happy About International Business Communications series. Angelika Blendstrup, Ph.D., is the founder and principal of Blendstrup & Associates. She specializes in individualized, intercultural business communication training, accent reduction and presentation skill coaching. She works with international as well as U.S. executives to assist them in improving their written and oral communications skills, and prepares them how to write and give effective presentations. Angelika holds a Ph.D. in Bilingual, Bicultural Education from Stanford University. She speaks five languages and has taught U.S. business communications skills to international executives both privately as well as in companies in the Silicon Valley such as DreamWorks, Sun Microsystems, Microsoft, Oracle and Cisco. She is also a Co-Executive Editor of the Happy About International Business Communications series. Angelika can be reached at angelikab@stanfordalumni.org.